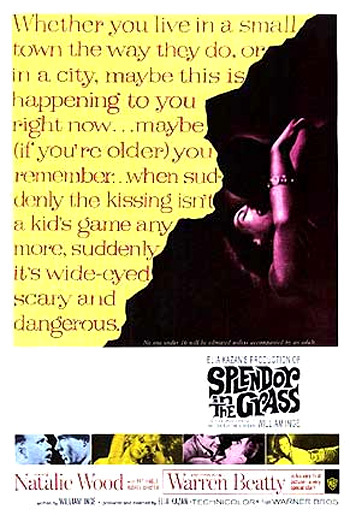 Splendor in the Grass (1961) is another of director Elia Kazan's dramatic, hyperbolic films with daring and controversial content for its times - sexual repression and neurosis. The intriguing, over-wrought film is a tragic, coming-of-age melodrama from Pulitzer Prize-winning playwright William Inge's original screenplay - it was Inge's first story written directly for the screen and he received a nomination (and the film's sole Oscar) for the Best Original Story and Screenplay for his work (one of the film's two Academy Award nominations). Whether you live in a small town the way they do, or in a city, maybe this is happening to you right now...maybe (if you're older), you remember...when suddenly the kissing isn't a kid's game anymore, suddenly it's wide-eyed, scary and dangerous. Another stated: "Alone, unheard, unheeded, a young boy, a young girl, drowning in love." The mood and story line of the stormy relationship between two star-crossed, teenaged lovers parallels the poem as the adolescents meet, fall obsessively in love and become sexually awakened, face repressed sexual attitudes, parental pressures, turmoil, social constraints and class differences, and ultimately break up and are traumatized without consummating their love. The values of the business-oriented civilization - at the time of its greatest crash - coincides with the collapse of their tender romance. In a quasi-Romeo and Juliet script, Warren Beatty marked his screen debut (after starring in the Broadway play A Loss of Roses), and co-star Natalie Wood received a Best Actress nomination (her second of three career nominations) for one of her finest (if not the best) screen roles. Reportedly, the stars began an off-screen love affair while making this film - a story of unconsummated passion between a rich midwestern boy and a passionate young girl. Although it was an early 60s film, it followed a number of films from the 50s (some of which were youth exploitation films) that portrayed the problems of youth, such as Picnic (1955) (another filming of a William Inge play), Rebel Without a Cause (1955) (with Natalie Wood), Kazan's own East of Eden (1955), Peyton Place (1957), A Summer Place (1959), and the same year's great musical West Side Story (1961). Deanie: Bud, I'm afraid. (They kiss and embrace more.) Don't, Bud. Angry at her, sexually frustrated and slightly humiliated, Bud leaves the car and stands by the waterfall, stating: "I'd better take you home," as she slips on her boyfriend's striped letter sweater. A title card 1928, SOUTHEAST KANSAS - is superimposed over a plain, wood-frame house (the Loomis residence) and storefront for the family butcher business - Fancy Groceries. Bud pulls the roadster up in front, as Deanie's mother Mrs. Frieda Loomis (Audrey Christie) notices their arrival on the porch and overhears Bud tell Deanie: "We've had enough kissing for tonight." Not wanting to be seen, she stealthily peers at them through the front door window as they can't restrain themselves for a goodbye kiss. In the dark living room, Deanie's body language exhibits tremendous sexual longing - she leans backward as she strokes her hair and neck. She hugs a pillow as she reclines on a sofa with her legs extended. Her domineering mother, who forces her daughter to drink a glass of milk, reveals that they are from a poor family that is struggling financially to afford her education, and there's little possibility that their shares of rising stock in the Stamper oil company may help ("If we sold those stocks, we'd make $15,000 and maybe we can even send you away to college next year. Well, we're not going to sell.") Deanie dreamily places her ear next to a giant shell - listening to the far-away roar of the ocean elsewhere. She stutters her unconvincing excuse for being with Bud: "We were studying together." Mrs. Loomis: Now Wilma Dean. Bud Stamper could get you into a whole lot of trouble. And you know how I mean. Boys don't respect a girl they can go all the way with. Boys want a nice girl for a wife. (She slightly cracks open the door.) Wilma Dean, you and Bud haven't gone too far already, have you? Deanie: (from inside) No, mother. Mrs. Loomis: Tell me the truth, Wilma Dean! Deanie: (opening the door all the way) No, Mom, we haven't gone too far. Mrs. Loomis: That's a relief. Deanie: Mom...is it so terrible to have those feelings about a boy? Mrs. Loomis: No nice girl does. Mrs. Loomis: No, no nice girl. Mrs. Loomis: Your father never laid a hand on me until we were married. And then I-I just gave in because a wife has to. A woman doesn't enjoy those things the way a man does. She just lets her husband come near her in order to have children. (Deanie stands with her back toward her mother.) Deanie, what's troubling you? After her mother leaves, Deanie throws herself onto her bed, casts away her brown bear in disgust, grabs her pillow, and thrusts her chest into it. Her sexual longings burst forth as she imagines hugging her sweetheart while glancing at Bud's many pictures plastered above her dresser. Deanie caresses each one with a kiss, and then kneels at her bedside to recite the Lord's Prayer. In the Loomis' master bedroom where Mr. Del Loomis (Fred Stewart) snores noisily, Mrs. Loomis excitely tells him that Deanie is "in love" with the Stamper boy: "He'd be the catch of a lifetime, Del!" She is in favor of their romance, but expects marriage before physical affection. You're watchin' yourself with her now, aren't ya, son? You-you're not doin' anything, boy, you're gonna be ashamed of, are ya?...She's a nice kid, son. She's a good-looker. I've known her folks ever since - well, old Del and I were boys together. I got nothin' against 'em, Bud, 'cause they're poor. I'm not a snob or anything like that. The only difference between me and Del is that I got ambition. But if anything was to happen, you'd have to marry her! You'd have to marry her, son! You realize that, don't ya? You get a girl in trouble, boy, and you gotta take the consequences. (They engage in horseplay by punching each other playfully in the arm.) We got a future, boy...The first thing we're gonna do, we're gonna get you an education - the best. Four years at Yale...My company is gonna merge with one of those big Eastern companies. I'm gonna put you in there. I wanna put you in there, boy...I'm linin' up a future for ya, boy...Bud, there is nothing in this world that I wouldn't do for you, boy. There's nothing I wouldn't do if you do right. If you do right, Bud. Now don't disappoint me, son. As he states that he's "had one disappointment already" [his daughter], his frail, soft-spoken wife Mrs. Stamper (Joanna Roos) enters the room. In his own bedroom, Bud is also frustrated by his father's words as Deanie was. He hurls a soccer ball at the wall and also buries his head under his pillow on his bed.